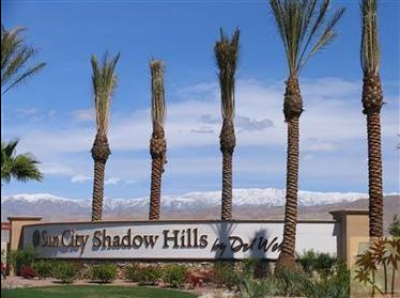 Del Webb Sun City Shadow Hills in Indio is Dell Webb’s latest addition to the desert resort communities in Indio, CA. It is another impressively designed active adult living community. Taking a deep rooted pride in excellence and dependability, Del Webb Sun City Shadow Hills communities beckon to prospective homeowners with promises of a myriad of activities, enjoyable golfing, and community living that inspires even the most eclectic of tastes. Sun City Shadow Hills real estate, beginning in the mid $237,000’s offers some homes that are ‘ready to move in’, and others that are waiting for your specifications to finalize the design. With the addition of 10 new floor plans and spacious rooms offering awe inspiring views through windows framing the desert with the majestic mountains in the background, the community provides quality comforts you deserve, and indulgence in them is encouraged for all members. Expanding on the ever popular resort style ambiance, Del Webb Sun City communities have enhanced that feeling to encourage a sense of community as well as placing the focus on relaxation and a cultured lifestyle. Perfect weather, sunny skies and the expectation of a beautiful day ahead also serve to enhance your experience of the challenging 18 hole golf course spread across luscious emerald green fairways surrounded by the awe inspiring mountains and the beauty of the desert. The fitness center, made available to members and their guests, accommodates nearly any requirements for workout regimes with enough variety to aid you in achieving your fitness goals. The level of social interaction that is encouraged by the community atmosphere is prevalent at the Montecito Clubhouse, among others, boasting a full social calendar offering something for everyone to enjoy. Enjoying time with family, friends, or neighbors, the club house caters to your desires with superb service. For over 40 years, Dell Webb has created a tradition of excellence based solely on their determination to produce high quality living communities that place emphasis on family, fun, and enjoyable living. Their reputation is widely based on their determination to provide quality homes on selective choices of real estate in Sun City Shadow Hills. Dell Webb is prominently known for their unrivaled excellence through their workmanship and their dedication to client satisfaction. In keeping with their tradition of quality they design each home with the clients and the community in mind while corresponding with the overall ambiance of the location. Becoming a member of this spectacular community in Indio, CA, opens up your future to new experiences while broadening your horizons in life. Find your beautiful sunset in Sun City Shadow Hills at our adult living community, and make every day your perfect day. Indulge your sense of adventure and your desire for relaxation by investing in your future and settling in as a member of the community. Let us know if you would like to see property at Sun City Shadow Hills, we would be glad to help you find the home you have been looking for. If you would like to see property in Sun City Shadow Hills, please call us at the numbers below. Were committed to helping you find the home of your dreams.